Perhaps South by Southwest Interactive promoters should send Meerkat a check—or at least a thank-you card. Not since Foursquare's launch in 2009 has the Austin, Texas, festival produced a break-out hit of this magnitude, and some tech industry players had begun to wonder if the SXSW magic still existed. Meerkat, a live video streaming app, started making waves a couple weeks ago as a way for people to host impromptu video sessions through Twitter. Right away, brands like Starbucks, Red Bull and the Miami Dolphins began experimenting with it. And then it became the favorite new digital toy of SXSW goers, virtually turning back the clock a few years to when everyone expected big tech successes to occur at the conference. McAdory Lipscomb, Jr., a tech startup consultant in New York, suggested that Meerkat's emergence has reestablished South By's street cred. "SXSW is now the launch point for startups that are looking for a receptive, target audience," he said, "and they will find it in the hill country of Texas." Venture capitalist Kelly Hoey agreed, but said that "your product should be truly disruptive, slick and ready to absorb all the attention. Meerkat demonstrates that you can cut through all the noise at SXSW when the product enhances the experience or adds value." Lipscomb went on to predict triple-digit, month-over-month growth for the social-mobile video platform. "Meerkat will drive a new adoption of video and personal video sharing," he explained. "I expect that we saw the model in early days of cable where the platform created distribution opportunities exponentially larger that traditional over the air TV. 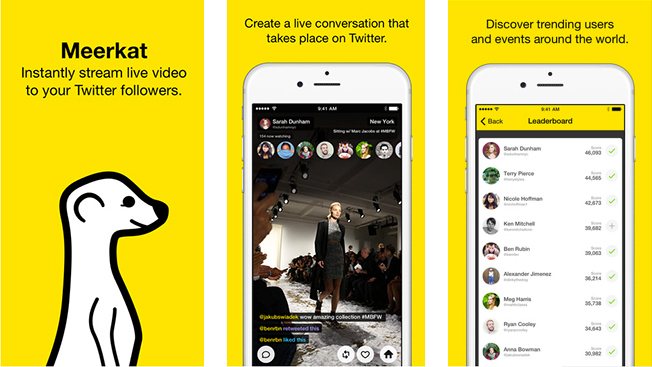 Meerkat has provided a piggy-back mechanism that bring more video into the stream." It's going to be worth keeping an eye on Meerkat's growth rate. The three-week-old company told The Wall Street Journal that it had 120,000 users going into South by and later informed Mashable that it grew 30 percent daily during the festival. So Lipscomb's projections don't appear far off. Going into the festival, Meerkat's dust-up with Twitter—which was the original South by startup break-out hit in 2007—had the tech world buzzing. The app uses Twitter accounts to let people create an account. Then when someone shoots a video, it automatically tweets out a link. Twitter isn't keen to have third-party apps plugging into its social graph as it tries to build out its own video products, so it tried to crack down on Meerkat last week. The brouhaha piqued folks' interest. That news kept the momentum for Meerkat going this week when SXSW's roster of startups, brands and agencies descended on Austin and couldn't seem to get enough of the app, using it to document sessions, live music, parties and their whereabouts. Even comedic actor Julia Louis-Dreyfus (who was in Austin to promote the upcoming season of Veep) used the app. The chatter appeared to be significantly more substantial compared to the momentary successes of recent South by buzz kings, namely GroupMe and Color from 2011 as well as Highlight in '12. And due to the rise of mobile video, Meerkat's technology seems more zeitgeist-y and primed to make a longer impact. Meanwhile, Meerkat's CEO Ben Rubin and his small team strolled around Austin wearing bright yellow T-shirts with the app's logo to promote it. While standing in line at GE's BBQ activation last week, the team checked out the energy giant's setup as others whispered about the app. Over the past few years, SXSW has drawn in more brands and agencies that overshadowed the festival's startup scene. But, McDonald's, MillerCoors and Mondelez were among only a handful of marketers making memorable noise at this week's event. Instead, companies seemed focused more on fitting into the South by culture. "There are definitely more brands coming to capture the attention of a younger generation than we've ever seen, but what's different is their level of participation," said Ben Gaddis, chief innovation officer at T3. "A full spectrum of brands, not just tech companies are sponsoring pitch events, holding startup contests and spotlights, setting up villages for entrepreneurs and announcing investments." That said, Meerkat reanimates SXSW's history of helping startups break out in the tech world, said Todd Dipaolo, CEO and founder of inMarket. "There can be some bigger stars that get talked about more and other ones that percolate up," Dipaolo said.